>Thanks to Kitchen Poets Vault for posting my Winter solstice poem about my annual solstice day activity: baking Finnish pulla (cardamom) bread. I can think of nothing better than the smell of cardamom bread in the oven: it sustains the spirit on the darkest day of the year. I bake several loaves and bring it to holiday gatherings. Yummy. 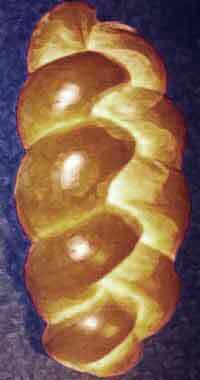 The poem originally appeared at Tattoo Highway, and the page features this wonderful illustration of a braided loaf.